Welcome back, great to see you. I know I never got my post up last week. Things have been a little crazy with me the last week or so. The days are a blurr it seems not enough hours in the day. I've had alot on my plate and trying to keep up can sometimes get to you after a while. So I finally got into my scrapbook room and was able to sit and create some cards. I've gotten quite a few done so I'm planning on posting twice this week to help with my absence last week. I guess enough about my full days I'm sure yours are the same. That's why it's important to sit back and really make time for the things that you enjoy or you will never have the time. and life will just pass you by. 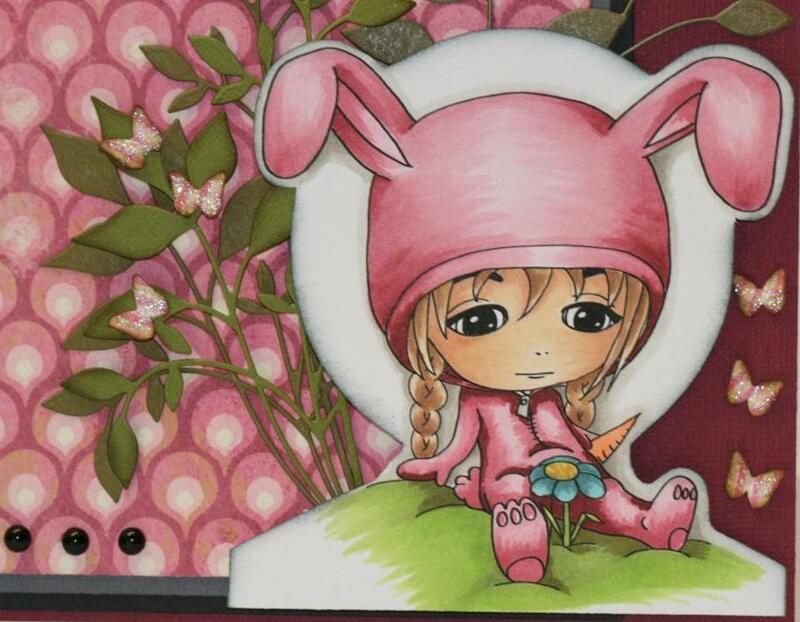 This adorable image is from a new designer at Whimsy Stamps. It's from Scrappers Delight and this image is called Baby Boo Bunny-long hair. Isn't she adorable, and fun to color. I really enjoyed making this card. Take some time for yourself and create a wonderful inspiring project, jump over to the whimsy blog and check out all the wonderful creations from the Design team. I just got a fun package in the mail and in it was a die from memory box. It is really delicate. I foam squared it up that was a little tricky cause it's all so delicate. A closer look at the image. Supplies: Bazzill cardstock. MME patterned paper, Spellbinder Fancy Framed Tags one, Memory Box die cut Fresh Foliage, I just typed the sentiment on the computer, Martha Stewart butterfly punch, copic markers, stardust stickles from Ranger, Bo Bunny pearls. Wow she turned out wonderfully, I love the carrot, wink, wink! Nice die, very cool...nice card...you did great friend! WOW!! okay sorry about the goofy delete post. 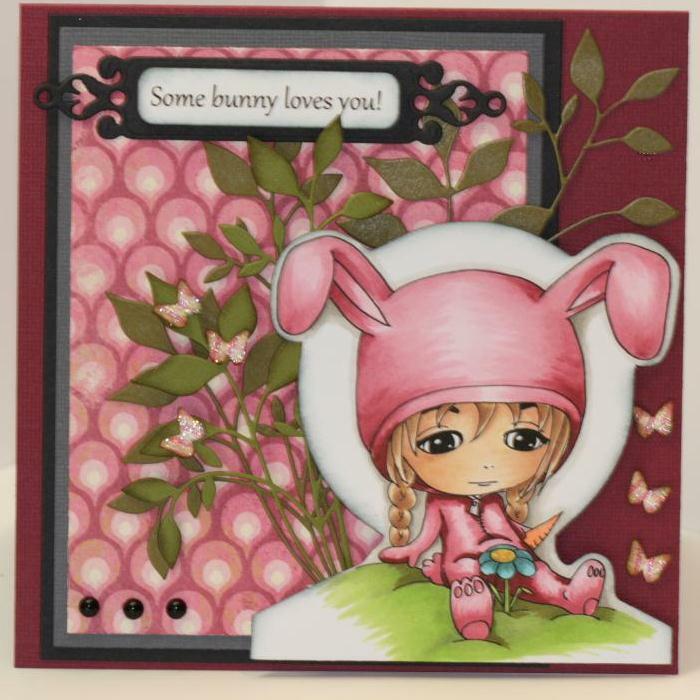 LOL... Love your card... loving the adorable pink bunny and you did such a great job with the hair!! 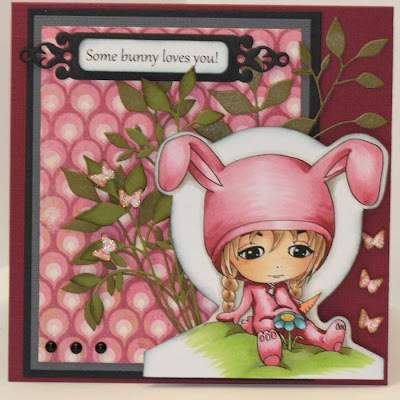 hopped over from MIM challenge blog..
Hi, Charlene! 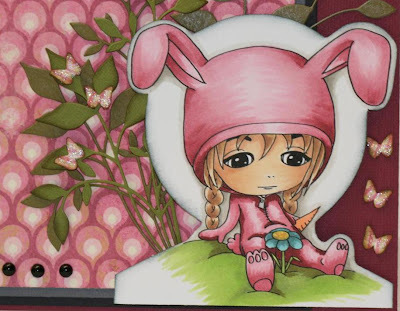 What an amazingly colored and shaded - super adorable, wonderful card! Great for thinking of you, get well or Easter. I'm so jealous over your copic skills! WOWOW! Very pretty. This is just gorgeous. Thank you for joining us at Artistic Inspirations this week. Gorgeous card! Very pretty image and wonderful elements. Thanks for joining us at Card Mania Challenges. Good luck and hope you'll join us again.